Meb Keflezighi is an American! I don’t understand the position that some people are taking that Meb Keflezighi is not American enough to be considered the first American to win the marathon since 1982 when Alberto Salazar won. Which is silly, because even if he had become an American citizen the week before the race he would still be an American. Our country is founded on immigrants and very few of us can trace our roots back more than a few hundred years to this soil. It’s even sillier because Meb was not a runner when he was 12 years old and moved to the United States. His entire development and running career through high school, college and as a professional has been here in the United States. What’s even sillier is that these racist morons all mention that an American hasn’t won since 1982 but we shouldn’t rejoice as much because Meb was born in Eritrea. If the criteria for winning as an American is that you were born here, then why not point out that Alberto Salazar was born in Cuba and has only been in the United States since he was 2 years old? Oh, wait, Alberto Salazar is Hispanic and doesn’t have black skin. Give me a break. I celebrate Meb’s win in New York City this past weekend the same way that I’d celebrate any other American winning a major competition. He ran a great race and I’m glad to see him win not only because he shares my nationality, but also because the couple of times that I’ve met him he’s been a very nice and humble person that is easy to like. The more I read about this man the more proud I become that he runs as an American. 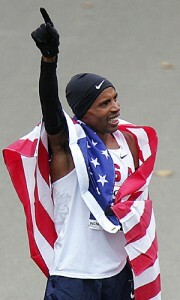 From his victory on the streets of New York City to his appearance on David Letterman Meb is a class act and an American. 100% agree with you. What a shame! Forgot to add that “the test” is not joke, many born-American wouldn’t pass it!